Beyond the protective barrier wall of razer bushes that surrounds Ty’s home, lurk mighty creatures that devour anyone that trespasses into their world. A haunting land filled with massive snakes, invisible spiders, giant monsters formed from stone, and insect creatures so hideous and evil that they ride on the backs of giant rats to surround and devour their prey. Deep within this formidable land and desperate for survival, Ty will form an alliance with the most unexpected team of creatures imaginable. A fierce, slithery, fifty-foot vipercon named Normack and Torg, a half-man half-reptilian Zintarian Guardian will join together to survive. Throughout this desperate journey, their constant taunting and never-ending teasing of each other, this ragtag trio will blast into the unexpected corners of the Shadow Forest until finally the desperation and the determination of Ty’s quest collide together. 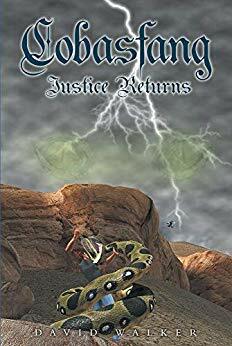 In the quiet of the night, as thoughts turn to anticipation, the dreams of the future will be determined by the actions of one… Ty will realize his destiny, the prophesized legend of “Cobasfang” rises again! $14.95 on Kindle.